Errol Spence: Who Can Beat Him? Errol Spence predicted a massacre ahead of his big fight with Mikey Garcia and he was about as good as his word. When last night’s clash of unbeatens was first announced, the general reaction was that Garcia, in attempting to win his fifth world title in as many weight divisions, was biting off way more than he could possibly chew – and so it turned out to be the case. Spence handed a game but oversized and outclassed Garcia a royal hiding in winning every single round, even winning by a whopping great 120-107 score on one of the three cards, the other two having the IBF welterweight champ winning via 120 to 108. In the later rounds, Spence putting some real spite into his target practice shots, the thought that the one-sided affair should be stopped was impossible to ignore. Garcia was being beaten up and it could be asked whether or not he will ever be the same fighter again. Garcia showed great courage but he should have been pulled out, allowed to fight again another day. If he does carry on, Garcia must of course move back down, to 140 if not 135 pounds. For Spence the sky is the limit. If he’s not the best welterweight on the planet already, he soon will be. But who is there he needs to overcome to prove his utter dominance of the 147 pound division? It seems only the equally gifted Terence Crawford has any shot at derailing the 25-0 southpaw. This fight simply has to happen, and providing both men win their next fight – Crawford to face Amir Khan in April, Spence perhaps to face superstar and all-time great Manny Pacquiao next – they should meet before the year is out. Hopefully they will get it on. Crawford is not expected to have too much trouble with Khan, and as great as Pacquiao is, or was, it would take a brave fan to predict a Pac Man win over Spence. 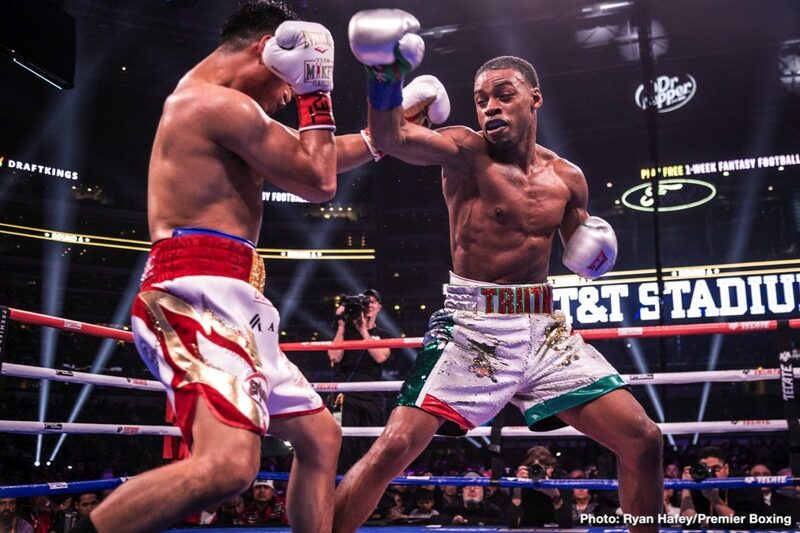 Spence doesn’t appear to have a single hole in his game and last night, in taking away Garcia’s unbeaten record, “The Truth” looked better than ever. Right at his peak now, or thereabouts (it’s scary to think Spence could get even better than he is right now! ), Spence has that look the special ones have. Indeed, can anyone beat him, Crawford included? Whether he is now pound-for-pound the best fighter in the world is down to opinion, but Spence cannot be far off, that’s certain. You are here: Home / Boxing News / Errol Spence: Who Can Beat Him?